"Dan Rupe paints the town he loves with expressive abandon and a high-keyed palette. Inspired by the animated summer energy, the rhythms of Commercial Street, the diverse architecture and color of the jumbled mix of historic and commercial and community landmarks, Rupe likes to be out on the street first thing in the morning, taking in the sensations of town and composing his eye, and singing with the summer spirit of Provincetown. He paints only from life, his composition ruled by his intuitive sense of formal order. He begins covering his canvas with a deep crimson wash. This ground gives his brilliant pure color , applied with an expressive, direct gesture, an electric charge. No matter how often or how long one looks at a Rupe painting, it is always the present tense. The tone of his palette, the freshness and clarity of primary colors, reflects an optimistic attitude, an intrinsic love of life." 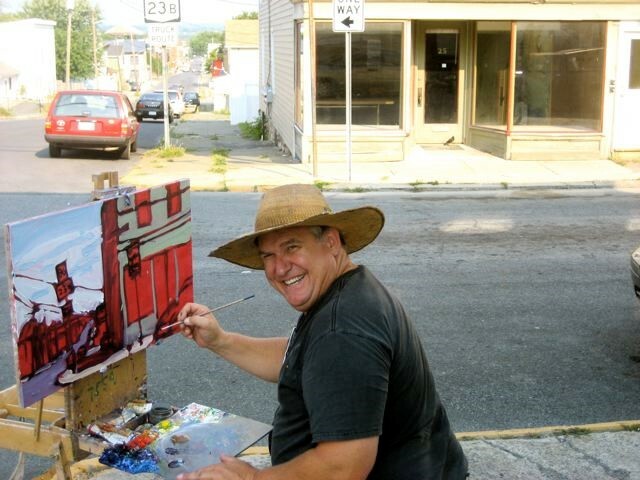 You‘ve likely seen him on the streets of Hudson, seated before his canvas in a multi-colored paint daubed t-shirt and shorts, his straw hat providing shade for all but his tanned forearms and knees. His splattered Technicolor Walkman tape player blasting, earphones neatly tucked beneath the hat alive and driving with the strains of Aretha Franklin, Tina Turner or Donna Summer. He is Dan Rupe, a supremely talented artist as bright and dazzling as his paintings. Dan’s mother had a beautiful singing voice and urged him to take music lessons. At eleven he got serious about oil paints. Turning sixteen he decided to be a painter instead of a musician. “My father took me for a drive and told me how difficult it was going to be making a living from my art. I though it wouldn’t be any more difficult that music.” The following year he went off to Interlochen Arts Academy in Michigan with his parents blessing. Established in 1991, Carrie Haddad Gallery represents mid-career and emerging artists of the Hudson Valley and beyond working in painting, sculpture, mixed media and photography. We organize 7 group exhibits per year in a 3000 square foot gallery space on Hudson's Warren Street. Copyright © 1991-2019 Carrie Haddad Gallery. All rights reserved.